As more females begin to play Rugby, the case for universities and high schools to support it under Title IX continues to grow. Rugby is the only full-contact, tackle team sport that compares to American Football. And, it's less expensive to fund with injuries rates comparable to soccer. These webpages have been created to provide an additional resource site for other clubs, individuals, and educators interested in using Title IX to expand opportunities for females to play Rugby; a full-contact sport with an inclusive culture. Ultimately, a lawyer will need to be consulted and included in the process. However, much of the preliminary work will need to be done by you. The following provides an overview of the progress girls'/women's rugby has made at the interscholastic and intercollegiate levels. In Texas, 184 HS-aged females were registered during the 2015/2016 academic year to participate in competitions governed by Rugby Texas, the state-based affiliate of USA Rugby (Madonna, Executive Director, Rugby Texas, 2016). This is a 530% increase since the 2010/2011 academic year (Marshall, Past-President, Rugby Texas, 2016). This increase has eclipsed the number of females participating in high school football in the fall of 2014, based on data from the National Federation of High School Associations. Despite a well-established 14th Amendment right to participate, female participation on high school 11-man football teams in Texas dropped 47% between 2010 and 2014 (316 down to 169). And, no females reportedly participated in 6-man football during this time period (National Federation of High School Associations, n.d.). While the cause for the progressive drop in football participation among HS females is unknown, it would be fair to say that a considerable number of females want to play a full-contact (tackle) sport – just not against males. While rugby is still primarily a club sport at the interscholastic (MS and HS) level the tide is rising for its adoption as a female varsity sport. The NCAA has given Women's Rugby emerging sport status. This recognition allows universities to support rugby as a women's varsity sport through the provision of athletic scholarships as well as access to quality coaches, facilities and support services. As of May 2017, sixteen (16) universities have a NCAA varsity women's rugby program. Forty (40) universities are need to support women's varsity rugby for the NCAA to sponsor a National CHampionship. Around 2016, the NAIA, an intercollegiate athletic association serving small universities, started a discussion to include rugby under it governance as a number of its member institutions have been supporting it as a quasi- to full-varsity sport. Probably the most recognized in within the rugby community is Life University (GA). Other NAIA schools with varsity-like status include Davenport University (MI), Linwood University (MO), Wheeling Jesuit University (WV) and American International College (MA). Until the NAIA adopts rugby as an emerging or full collegiate sport, these institutes and others compete within USA Rugby's collegiate competitive structure. USA Rugby lists 303 universities with women's teams playing 15s, 7s or both. ​Slowly but surely, more women's collegiate rugby clubs are doing the legwork to transition to true varsity status under the NCAA or NAIA. Minus the current 16 NCAA teams, 287 of the 303 teams remain to raise to official NCAA or NAIA endorsement. Additionally, new women's collegiate rugby club teams are continually on the horizon. In Texas, the following institutions of higher learning have a women's rugby team: East Texas Baptist University*, LeTourneau University*, Tarleton State U*, Texas A&M University - College Station, Texas A&M University - Central*, Texas Tech, U of Texas - Austin, U of Texas Dallas, U of Texas - San Antonio*, Texas State University*, U of North Texas*, San Angelo State University*, Lamar University, Sam Houston State University*, Rice University*. Unfortunately, these are all at the club sports level which means most their financial support comes from player dues, except TAMU-Central which offer scholarships. 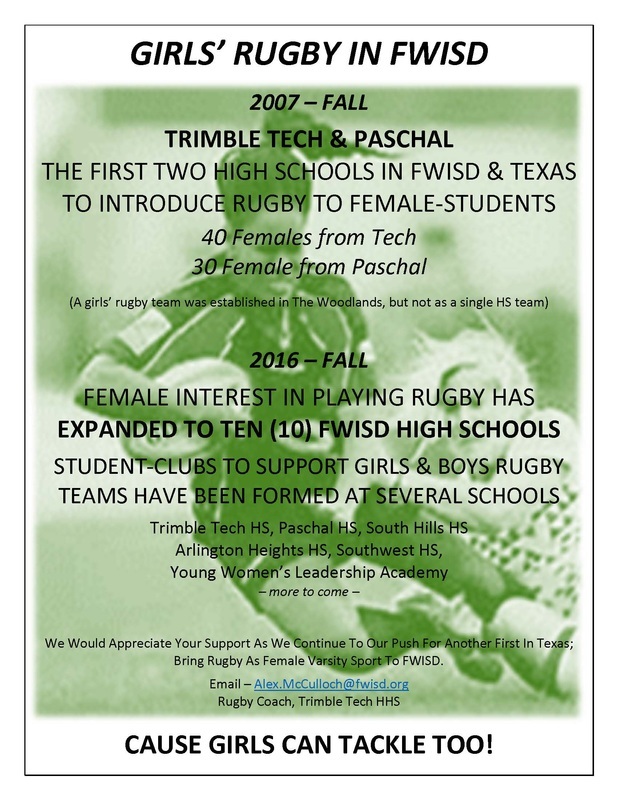 As a natural extension of our efforts at the high school level, Panther City Rugby has committed to assisting women's rugby attain varsity status at Texas Christian University (NCAA) and Texas Wesleyan University (NAIA). Both located in Fort Worth.